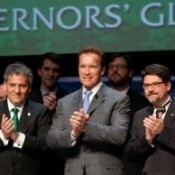 Governors from the US state of California, the Brazilian state of Acre, and the Mexican state of Chiapas have taken concrete steps to reduce greenhouse gas emissions from deforestation and forest degradation by creating a working group designed to help Acre and Chiapas generate REDD credits that can be recognized under California law. 16 November 2010 | Governors from the US state of California, the Brazilian state of Acre, and the Mexican state of Chiapas have taken concrete steps to reduce greenhouse gas emissions from deforestation and forest degradation (REDD) by creating a working group designed to help Acre and Chiapas generate REDD credits that can be recognized by California’s Air Resources Board (ARB) and sold as offsets to industrial emitters in California once the state’s mandatory cap on greenhouse gas emissions goes into effect at the end of next year. The announcement comes less than two weeks before UN-led climate talks begin in Cancun, Mexico, and it signals a growing willingness among sub-national entities such as states and cities to move on climate change even as national governments and international negotiating bodies stall. It’s part of a deal signed on Tuesday at the third annual Governors’ Global Climate Summit (GGCS 3) at the University of California, Davis, which ushered in a new acronym: the “R-20”, which is a global coalition of subnational governments as well as private-sector companies and nongovernment organizations (NGOs). “The R-20 is a global coalition committed to fast tracking the development of clean technologies, climate resilient projects and green investment, and influencing national and international policies,” according to a Governors’ Climate and Forests Task Force (GCF), an initiative formally launched at UN climate-change talks in Poznan, Poland, in December, 2008. The GCF is comprised of 16 states from around the world – three from the United States, four from Indonesia, five from Brazil, and one each from Mexico and Nigeria. “The working group is comprised of experts from all countries, and the ideal situation would be that they come up with a linking agreement by the end of next year that can be submitted to the ARB,” says Anthony Brunello, a consultant with California Strategies who previously served as the California Natural Resources Agency’s deputy secretary for energy and climate change. Acre was chosen in part because it passed a sweeping framework for developing payments for ecosystem services in October, and Chiapas is on the brink of finalizing a REDD readiness plan. “The recent legislation reflects the fact that both of these states are leaders in their respective countries,” says Brunello. “In both Chiapas and Acre, you find widespread support for REDD from both stakeholders and govt officials. For the scheme to meaningfully impact the rainforests, other potential buying states will also have to join in. Under California’s laws as currently written, international REDD credits can be used to offset a grand total of just 74 million tons of carbon emissions from 2012 to 2020 — and that’s the best-case scenario.